The MSC Alumni Basketball League opened last November 8, 2014 at the Teomora covered court. The program started with the convocation, singing of the National Anthem, recitation of the MSC Mission, Vision, and Philosophy. Then the high school students had a cheerdance presentation of the winning teams during the school’s sportsfest. To ensure you receive our newsletter in your inbox, please add msc@msc.edu.ph to your email address book or safe sender list. Just click here to subscribe, or just send an email with “Subscribe” on the subject line to newsletter@msc.edu.ph . Dennis Gutierrez and Lea Capule, graduates of MSC now teaching at Col. Lauro D. Dizon Memorial National High School (CLDDMNHS), were recently awarded the Golden Laurel Achievement Awards. 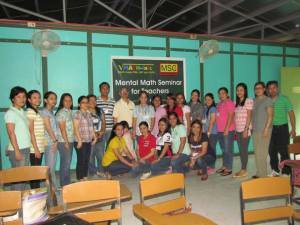 MATH-Inic Philippines started the series of Mental Math Training seminars for teachers on November 16, 2014. A total of 23 teachers, mostly from the San Francisco District attended the training at the green school campus of VYP-MSC Institute of Technology at Sitio IX, San Gabriel, San Pablo City. MATH-Inic President, Virgilio “Sir Ike” Prudente personally conducted the training on mental math techniques and methods to make teaching math easier and fun. Give your child the MSC Advantage – Math, Science, and Computing, enroll them at MSC! MSC has always instilled in its students, faculty, and staff to always be aware of what is going on in the community/country and to take active part in activities that will affect the future of the society we live in. Whenever election comes, all members of the MSC staff, some faculty members and students become volunteers of National Citizens’ Movement for Free Elections (NAMFREL). There were times when MSC became headquarter for quick counts. Volunteers from civic and other groups would deliver results which were tallied by MSC programmers and encoders. Partial results will then be displayed on a big screen outside for people to see. The quick counts usually lasted for more than 24 hours. 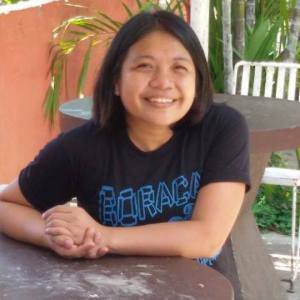 MSC – Madami akong naging experiences sa school na ito. Dito ako nakakuha ng true friends na up to now mga barkada ko pa din. Dito din ako natututo na makisalamuha sa iba’t ibang klase ng tao, before kasi mahiyain ako. Sa MSC bawal ang mahiyain, dapat involved ka sa mga activities nila na kahit ayaw mo sumali mapipilitan ka para sa grades pero later on mag-e-enjoy ka na din. When MSC occupied the 4th floor of the La Suerte building, there needed to be another venue to accommodate the “overflow” students from MSC Main (as what the students used to call MSC – La Suerte). What MSC found was the old building along Artemio B. Fule St. (upper Lopez Jaena) which used to be Agrix Supermarket. This new site was christened MSC Annex or simply Annex. Other equipment which could not be put in the fourth floor of La Suerte were placed at the annex. Equipped with one room each for typing and drafting a workshop, two classrooms and a music room. Annex housed the work area for highly-specialized courses like Autocad, a course specially suited for engineers, architects, drafting designers and others whose occupation involve drawing or designing of some kind. One yard is 3 feet or 36 inches, while one meter is 39.37 inches. This makes one yard to be about 0.9155 meters. But for practical use, we can approximate and use the rate 1 yard = 0.9 meters. We can easily do that if we apply MSC-8, multiplying by 9. Squaring is multiplying a number by itself. The square of a two-digit number ending in 5 is composed of 2 parts. The first or left hand part is obtained by multiplying the ten’s digit “By one more than the one before” or by the next number. The second part is always 5 x 5 or 25. Every week, for 25 weeks up to December 4, 2014 when we celebrate our 25th Foundation day, this newsletter will feature one math short cut. We will progress from the simplest to the simple. Believe you can do it! Just proceed one step ( short cut ) at a time, and be pleasantly surprised to discover none of the math short cuts are difficult! Forward this newsletter to your friends, relatives, and young kids. To ensure you receive our newsletter in your inbox, please add msc@msc.edu.ph to your email address book or safe sender list. Forward this mail to your friends and invite them to subscribe to the 25 Math Short Cuts Newsletter today! 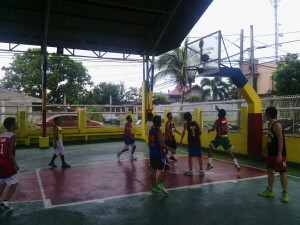 This entry was posted in Alumni, Events, High School, History, MATH-Inic, MSC, News, Newsletter and tagged 25 MSC, 25 MSC Newsletter, Conversion: Yards to Meters, Free Entrance/Scholarship Test at MSC, Hazel Flores-Maghirang, high school, MATH-Inic Conducts Mental Math Training for Teachers, MSC Alumni Basketball League update, MSC graduates receive Golden Laurel Achievement Awards, msc high school, msc institute of technology, MSC Origins part IX: Acquisition of MSC Annex, MSC: NAMFREL volunteer SPERM member, squaring numbers ending in 5 on November 18, 2014 by mscadmin. MATH-Inic Offers Most Useful Math ShortCuts This Summer in Six Locations! Ano-ano ang mga kursong maari mong kunin sa VYP-MSC IT? Sa MSC Caregiving Course - pay 50% later!